It's Facebook Fridays! for November 2, 2018! Living at ease, surrounded by all the material things that make you happy is a real possibility with the right tools. The Lucky Mojo Curio Company is holding a random drawing to give away 8 wealth-enhancing Prosperity spiritual supply prizes. 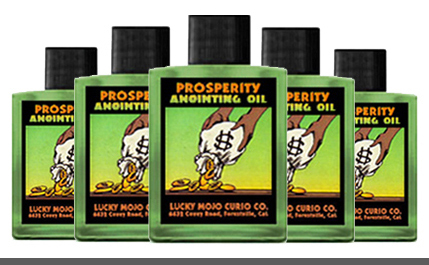 This week each lucky winner will receive a bottle of hand-made Lucky Mojo brand Prosperity Oil for anointing yourself, fixing your home or place of business, preparing green offertory candles for financial success, or feeding a money-attracting mojo bag. 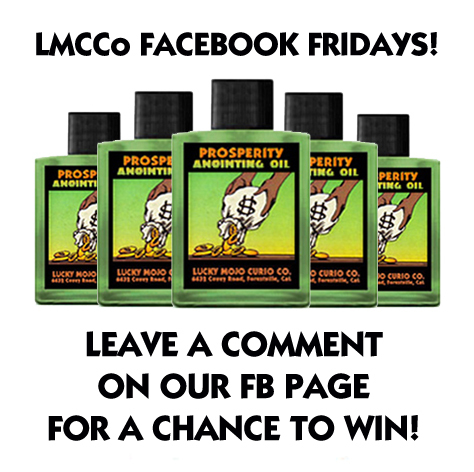 First thing tomorrow morning, we will select EIGHT winners at random, announce their names here, and ask them to message the Lucky Mojo Facebook Page with their mailing addresses, so we can send them their FREE Prosperity Oil. Reverend Ernest just checking in to encourage EVERYONE to enter the contest this week. A truly marvelous giveaway! We have a winner! In fact, we have 8 lucky winners! Our Facebook Fridays! winners for November 2, 2018 are: Kathryn Johnson, Stephanie Most, Criselda Garza, Philippa Jones, Wulf Higgins, Elliot Zeller, Taletha Foreman, and Rosalia D Choice.